Our oil is recommended for the local dishes such as, risotto with Garda Lake fish and pike with polenta. Olive oil is perfect for a raw, natural use, to dress bruschetta, salads and different vegetables dishes. This local traditional dish is present in different part of Northern Italy: carbonera is a peasant food. The essential ingredient is cornmeal which was cooked with different ingredients: poor people used what was available in their sideboard and could easily be cooked with polenta. 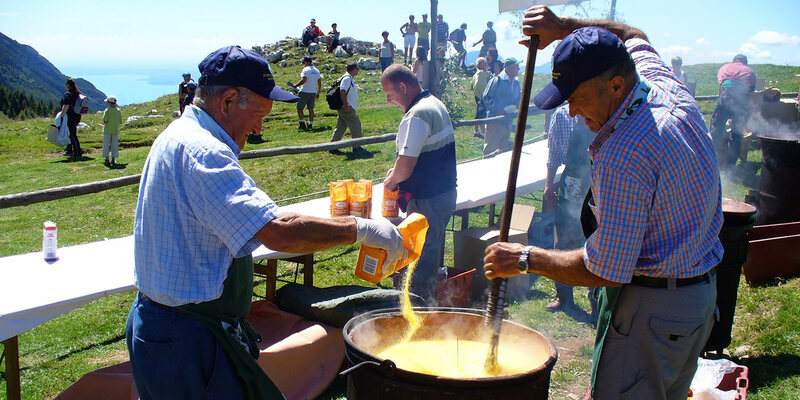 Cooking carbonera consists in adding cheese left-overs and olive oil to traditional polenta. Bring water to the boil and sprinkle cornmeal in it while stirring quickly and constantly. Keep on stirring and cook for 45 minutes: be careful not to let cornmeal stick to the pan bottom. When cooking is almost over, add cheese and olive oil. Wash tomatoes with care and lightly cooked them for a few minutes in boiling water. Peel off their skin, remove the seeds and dice them. Put them in a bowl, break the basil leaves into pieces and add olive oil, salt and pepper. Let them rest for about 30 minutes. Toast the slices of bread or cooked them lightly in a pan, rub them with garlic and sprinkle tomatoes over them. Wash and clean all vegetables with care. Cut them in regular pieces, except the onions. Bring white vinegar, wine, sugar, water, salt, pepper and bay leaves to a boil. Add carrots, green beans, cauliflowers, onions and at last, the peppers. Let them boil for a few minutes. Take off the vegetables and let them cool down. Put them in sterilised hermetic sealed glass jars and cover them with olive oil. Seal the jars and wait at least 30 days before opening. Warm up olive oil in a pan and brown the garlic. Add peppers, but be careful not to fry them. Cook spaghetti “al dente”in a saucepan. Drain spaghetti and cooked them in the pan for a few minutes. 1) First clean the sardines pulling away scales and bones and cut into small pieces. 2) put in a pan a little olive oil with sardines tomatoes cut into slices and cook until sardines will be dissolved, miraccomando not browned. 3) turn off the heat and add chopped garlic and parsley .aggiustate of salt and pepper. 4) boiled bigoli, drain and place in the pan making stir in the sauce, adding even A HANDFUL OF FRESH PARSLEY piping hot TRITATO.servite. this delicious dish we match a glass of Lugana, white wine that goes well with this piatto.buon appetite !!! !